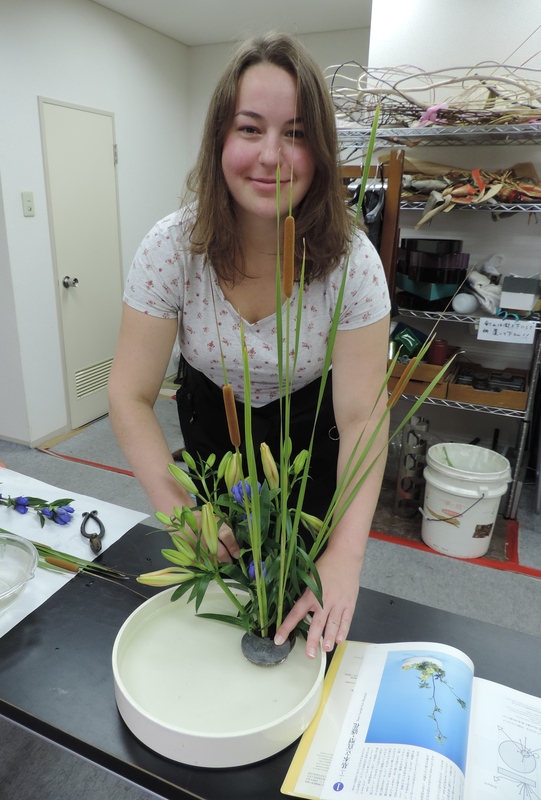 I’ve recently begun the journey towards honing the skill and art of Japanese いけばな (ikebana) flower arranging. In my journey I’m fortunate enough to be surrounded by some of the best ikebana artists here in Tokyo to help instruct and inspire me. As I’m just starting out my first lesson is to create a basic upright style moribana arrangement where the stems need to be precision cut and precision placed at fixed angles on a spiky kenzan. There are three main parts to the arrangement which are the shin placed at a 10˚~15˚ angle, soe at 45˚, and hikae at 75˚. 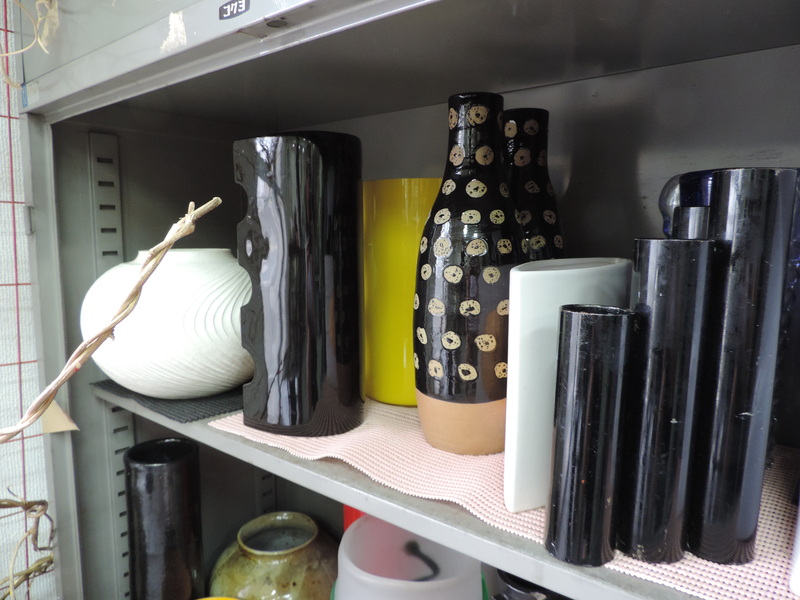 After the three main stems are perfectly placed it’s time to accessorize with jushi subordinate stems that add volume and depth to the arrangement as the kenzan is not supposed to be visible. 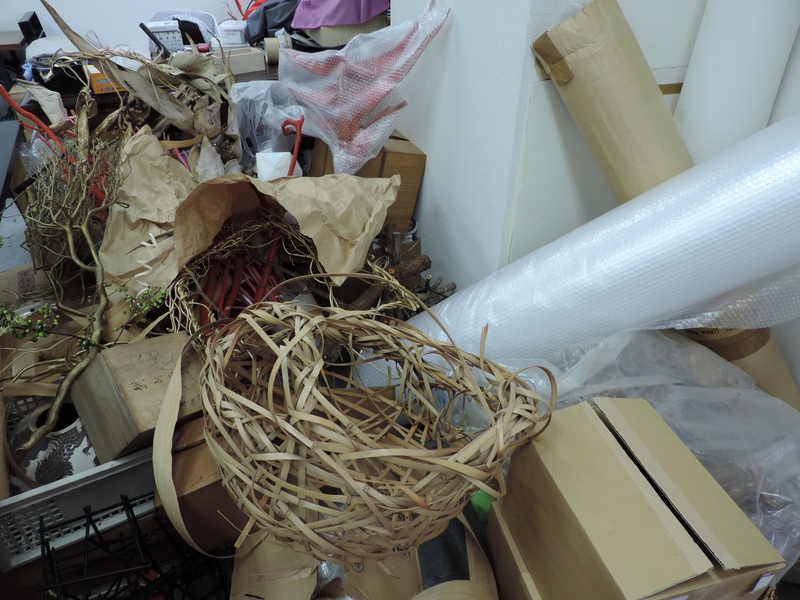 The studio is filled with interesting add-ons that can make fabulous arrangements truly spectacular despite what they might look like carelessly piled in the studio corner. But I’m far from the stage where I get to go off textbook so it’ll have to be something to look forward to in the future as I progress. 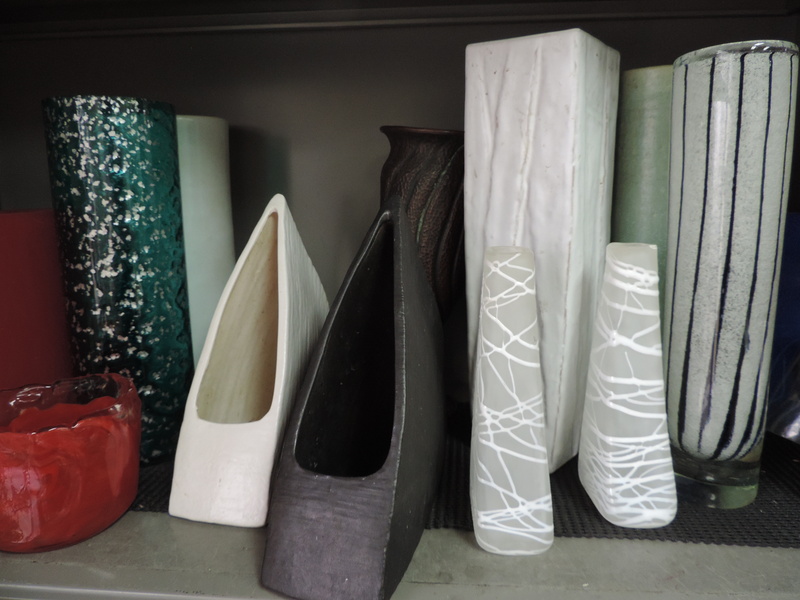 There are also many interesting vases in the studio but again those will have to wait until I get a little further along. 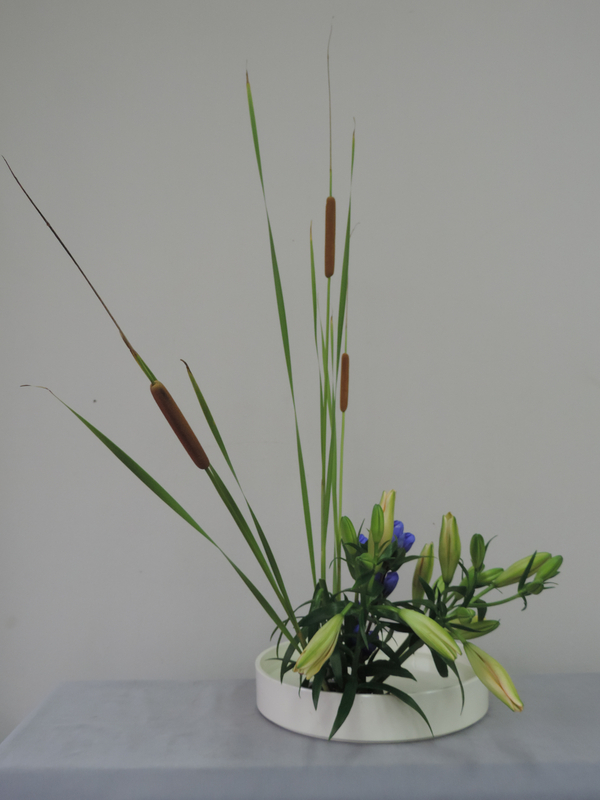 Here’s my first ikebana arrangement in its completed stage. What do you think? This entry was posted in Culture, flowers, Tokyo and tagged Culture, Flowers, Ikebana, lifestyle, Tokyo by linneabylinneanilsson. Bookmark the permalink. Fantastic, really nice. You can move on to a higher level immediately ! Congratulations! I´m impressed with your first arrangement. When your set arrangement has been judged, why not take the time to go completely creative and try your hands at one of the containers with a freestyle? I agree, you really have access to some interesting containers. Vad fint det blev! Nu kan du tävla mot mamma om vem som gör det finaste arrangemanget! As precision in placing is integral to this, creating balance, what happens when the lilies bloom? Surely they must spoil the original concept. Or is that taken into account in the design? Or perhaps when that happens you throw the lot out and start again. 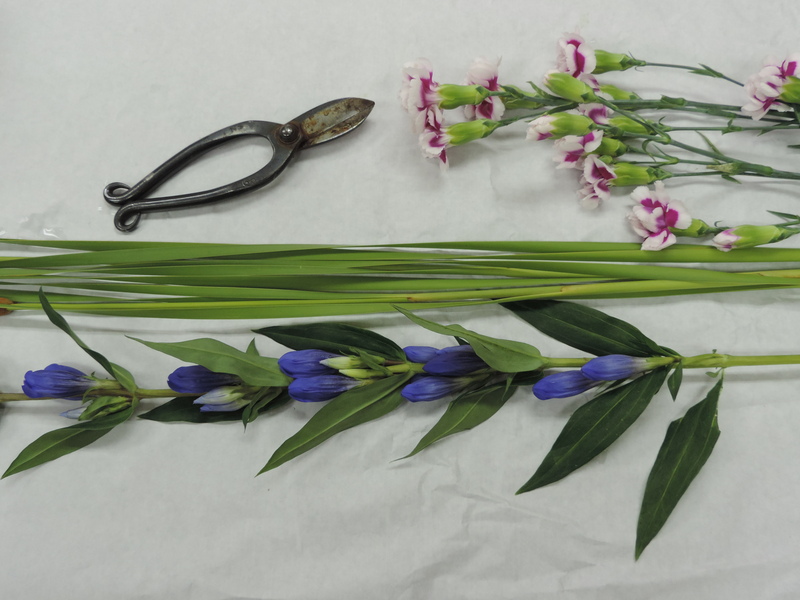 Shows how little I know about this, my flower arranging being little more than stuffing flowers and greenery into whatever vase comes to hand.